If the farm bill is reauthorized in 2018, the events of the last week will have been the first round. First, Congress revised the Agricultural Act of 2014 (the 2014 Farm Bill) in the Bipartisan Budget Act of 2018 (BBA 2018, P.L. 115-123). Specifically, a behind-the-scenes agreement between the House and Senate Ag Committees revised cotton, dairy and crop insurance. Second, following closely on the heels of that agreement President Trump released the annual Presidential budget. It included policy recommendations for cuts to farm bill programs. The following is a brief discussion of these issues. The Agricultural Act of 2014 created a new dairy assistance program called the Margin Protection Program (MPP). In short, this program triggered assistance at different margin levels based on the all milk price and a calculated feed cost. Dairy farmers could elect a level of coverage with different premium amounts for each level of coverage. If margins fell below the coverage level, using a consecutive two-month calculation, the producer would receive a payment (see e.g., farmdoc daily, May 1, 2014; July 17, 2014 and November 5, 2014). The first change to MPP in the budget deal was to eliminate the consecutive two-month average calculation, replacing it with a monthly calculation. The most significant changes to MPP were to the premium schedule. The 2014 Farm Bill had created two tiers of production for the program at 4 million pounds of production; above that level premiums were higher than they were for production below it. The budget act revised this upwards so that the cutoff is 5 million pounds. In addition, the premiums for production below 5 million pounds were reduced across-the-board. Table 1 compares the 2014 MPP premiums to the 2018 revisions. For additional perspective, Chart 1 provides an overview of the components of MPP back to 2012. The chart includes the all milk price and the average feed cost as calculated by the program but on a monthly basis per the 2018 revisions. The 2014 Farm Bill, as revised, calculates the average feed cost using the monthly average price of corn, soybeans and hay with specific factors (1.0728, 0.00735 and 0.0137 respectively); NASS prices were used in Chart 1. 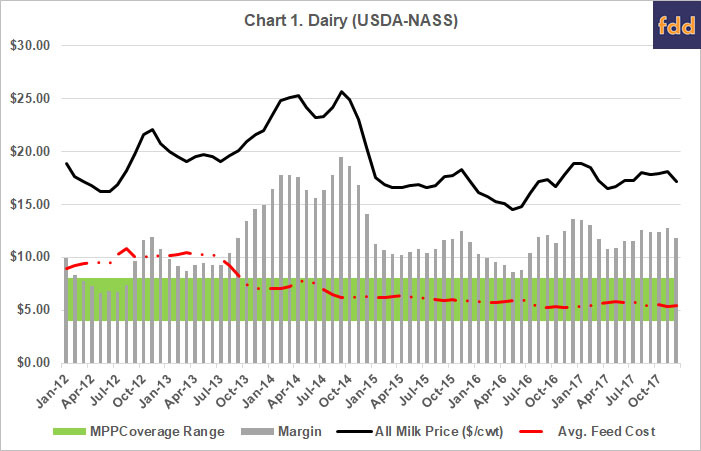 The margin is calculated as the monthly difference between the all milk price and the average feed price. Finally, Chart 1 indicates the coverage range for MPP on margins between $4.00 and $8.00. The BBA 2018 also revised crop insurance by removing the $20 million cap on expenditures for livestock crop insurance programs. This cap was a limiting factor on the availability of crop insurance for dairy farmers and livestock producers in general. Removing it is expected to expand the available insurance options for these farmers but also increase crop insurance spending. As discussed previously, the BBA 2018 also revised the covered commodity provisions for the ARC and PLC programs (farmdoc daily, January 11, 2018). It adds “seed cotton” to the list of covered commodities and permits farmers with generic base acres, which were former cotton base acres, to reallocate those base acres to seed cotton. The revisions are effective beginning with the 2018 crop year. The bill eliminates the generic base acre provision which permitted farmers to plant those acres to covered commodities and receive payments (farmdoc daily, April 13, 2017; April 20, 2017). Those with generic base acres are required to reallocate the as follows: (1) the greater of either 80% to seed cotton (20% to unassigned base which are ineligible for payments) or the average number of acres planted to cotton from 2009 to 2012; or (2) 100% of the generic base reallocated using the proportion of acres planted to covered commodities, including seed cotton, from 2009 to 2012. As before, the bill establishes a payment yield for seed cotton that is 2.4 times the upland cotton payment yield, which can be updated to 90% of the average yields from 2008 to 2012. It sets a reference price at $0.367 per pound with a loan rate at $0.25 per pound. For PLC, payments will be triggered when the seed cotton effective price falls below the reference price; the effective price is a formula that uses marketing year average prices for lint cotton and cottonseed weighted by production of each. 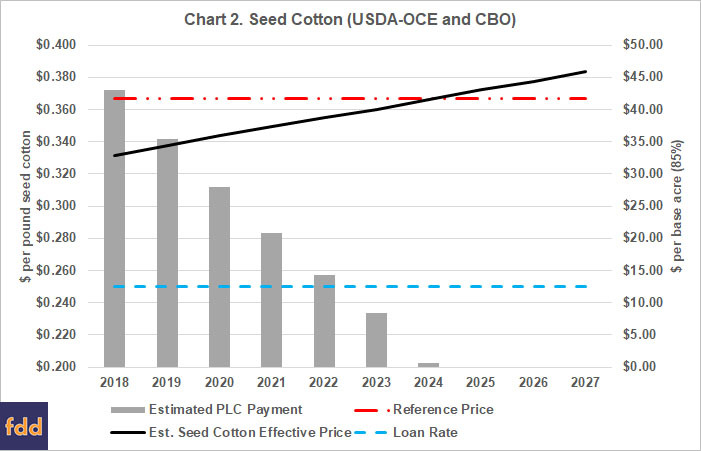 Chart 2 updates the estimates for seed cotton using the most recent long-term projections for cotton from USDA’s Office of the Chief Economist released in November 2017 (USDA-OCE). Specifically, this chart uses USDA long-term projections for upland cotton marketing year average prices (MYA) and production. USDA predicts somewhat lower upland cotton prices for the 2019 through 2023 crop years compared to CBO forecasts from June 2017. Note that the estimated payments use the updated cotton yields with the 2.4 factor and are factored by 85% to estimate payments per base acre. The 2018 Act also eliminates eligibility for STAX crop insurance for those farms that enroll seed cotton in the ARC or PLC program pursuant to the revisions, beginning with the 2019 crop year. The bottom line remains that the program as designed is expected to make payments for seed cotton on seed cotton base beginning with this crop year. In total, the Congressional Budget Office (CBO) estimated that the changes to farm programs in the BBA 2018 would add $1.25 billion in outlays over the 2018 to 2027 budget window (CBO, Bipartisan Budget Act of 2018, Feb. 8, 2018). Table 2 provides the specific breakdown for each of the changes to the farm bill (CBO, Division F, Feb. 8, 2018). As discussed previously, CBO’s estimates are expected to be updated in March to provide the CBO Baseline that will be used for the 2018 Farm Bill reauthorization process. The updated baseline is therefore expected to increase due to the BBA 2018 revisions. The Ag Committees would not be expected to have to offset those increases. 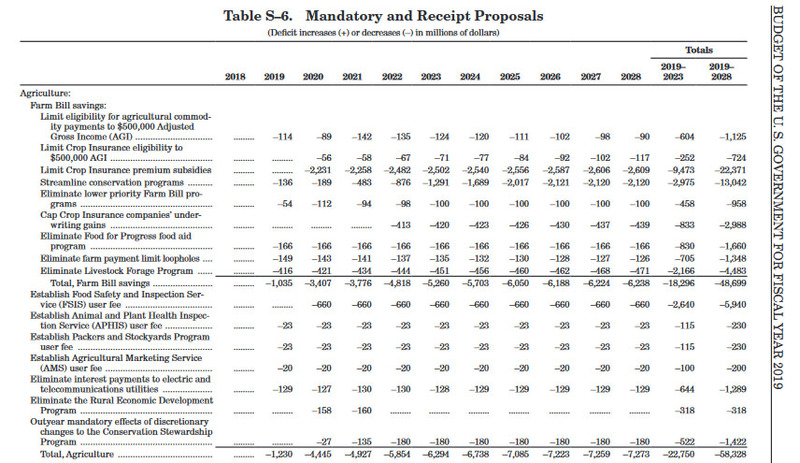 (3) Questionable Relevancy of the Presidential Budget Proposals. Just under a week after Congress passed and the President signed the BBA 2018, President Trump released the Administration’s fiscal 2019 budget (FY2019 Budget). Included in the budget were proposals for the upcoming 2018 Farm Bill reauthorization. In total, President Trump proposed $58.3 billion in savings (2019-2028) for agricultural programs, including $48.7 billion in farm bill savings. The proposal included Adjusted Gross Income (AGI) requirements for crop insurance and an across-the-board reduction in premium discount. The President also proposed over $13 billion in cuts to conservation programs, particularly the Conservation Stewardship Program (CSP). The following table (Table S-6) was taken from the budget proposal. It provides further detail on the proposed areas for reducing outlays from USDA, as well as the Administration’s estimates for spending reductions. It was also reported that the budget proposed spending reductions in the Supplemental Nutrition Assistance Program (SNAP) by over $213 billion (CBPP, Feb. 12, 2018). The proposed changes to SNAP also included a revision that would replace a portion of the monthly benefit used to purchase food with a package of non-perishable food items (e.g., canned goods, cereals and pasta) delivered to the household. The reductions proposed for SNAP, if passed by Congress in addition to the other proposed revisions, would amount to roughly $260 billion in total reduced spending by the 2018 Farm Bill; a level of spending reductions that would be unprecedented if it were to pass Congress. The proposals for reducing farm bill spending in a President’s budget are typically ignored by Congress. The Bipartisan Budget Act of 2018 may make it more likely that Congress ignores President Trump’s farm bill proposals. Congress increased spending on farm programs and crop insurance; the committees are unlikely to reverse course in the farm bill. Moreover, the proposed changes and reductions to SNAP are controversial and would be expected to meet significant resistance in Congress. At most, the President’s proposals could provide material for those who oppose the farm bill. They may resurface if the reauthorization debate reaches the House and Senate floors. If the farm bill is reauthorized on time in 2018, the matters of the last week should be seen as the opening round of the debate. It is significant that the Ag Committees managed to make two major revisions to the Title I programs for cotton and dairy without having to offset them as would have been required under regular order. This is expected to increase baseline at no cost to the committees, relieving some of the competitive pressures that would have resulted if offsets were needed. This could make it easier for the committees to write a farm bill this year. On the other hand, however, addressing cotton and dairy concerns in this manner could reduce the motivation for reauthorizing the farm bill. This could prove decisive given the challenges for Congress in a mid-term election year. The initial conclusion is that changes for cotton and dairy in a budget deal constituted an unusual and unprecedented move, the full implications of which cannot be known at this time. Coppess, J., C. Zulauf, G. Schnitkey, and N. Paulson. "Reviewing the Latest Cotton Proposal." farmdoc daily (8):5, Department of Agricultural and Consumer Economics, University of Illinois at Urbana-Champaign, January 11, 2018. Coppess, J., C. Zulauf, G. Schnitkey, and N. Paulson. "Beneath the Label: A Look at Generic Base Acres." farmdoc daily (7):68, Department of Agricultural and Consumer Economics, University of Illinois at Urbana-Champaign, April 13, 2017. Newton, J., and M. Bozic. "MPP-Dairy Dashboard: Evaluating Milk Prices Needed to Trigger MPP-Dairy." farmdoc daily (4):214, Department of Agricultural and Consumer Economics, University of Illinois at Urbana-Champaign, November 5, 2014. Newton, J., and T. Kuethe. "Mapping the Size of Dairy Safety Net Programs: Comparing MILC and the Margin Protection Program." farmdoc daily (4):133, Department of Agricultural and Consumer Economics, University of Illinois, July 17, 2014. Newton, J. "2014 Farm Bill: The Margin Protection Program Dashboard MPP-Dairy." farmdoc daily (4):80, Department of Agricultural and Consumer Economics, University of Illinois at Urbana-Champaign, May 1, 2014. Paulson, N., G. Schnitkey, J. Coppess, and C. Zulauf. "Have Generic Acres Impacted Planting Decisions?" farmdoc daily (7):73, Department of Agricultural and Consumer Economics, University of Illinois at Urbana-Champaign, April 20, 2017.